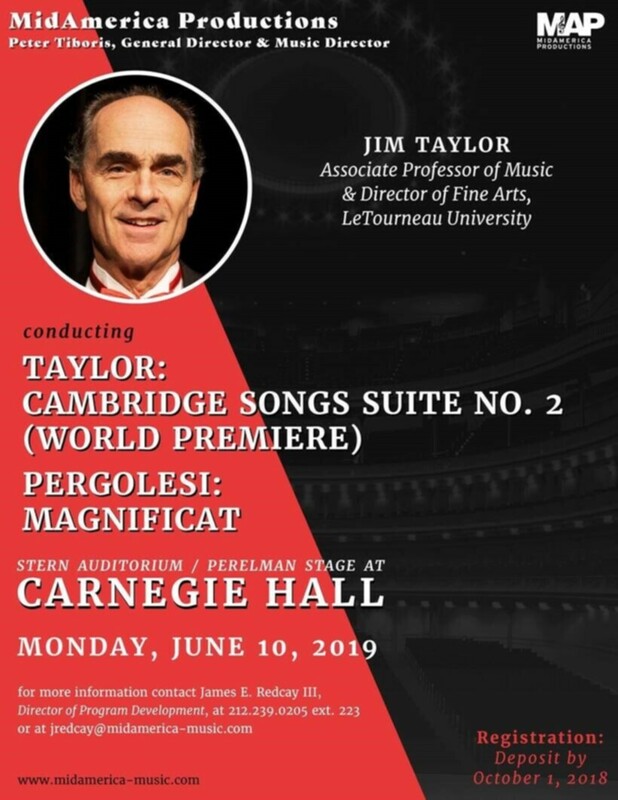 Taylor will be taking with him the LeTourneau Singers, the Longview Civic Chorus and other experienced choral singers from around East Texas to New York for this once-in-a-lifetime event. Other music being presented includes the Baroque work Magnificat by Giovanni Battista Pergolesi. Experienced choral singers from around East Texas who are interested in participating can contact Taylor by email at JimTaylor@letu.edu for an audition and details. Fundraising events will be held throughout the next several months to raise funding to help students with costs of travel. One of the fundraisers is an upcoming old-fashioned “Hymn Sing” event on from 5 to 6:16 p.m. Sunday, Sept. 30, in the Speer Chapel at LeTourneau University campus in Longview. The public is invited to come sing old-fashioned hymns with harmonies and parts, a cappella singing and opportunities to call out favorites. The Hymn Sing will be led by Taylor and David Berryhill of the First Baptist Church of Kilgore, which is providing the hymnals. A love offering from participants will be received to help the LeTourneau Singers with the trip to Carnegie Hall. An online raffle for a chance to win a trip to New York City, including airfare, hotel accommodations, a concert ticket to the Carnegie Hall performance and $100 spending cash is being conducted at moveup.letu.edu/carnegiehall. Each raffle ticket will provide one chance to win Only 200 tickets will be raffled. Others can pledge support at the same website. LeTourneau Singers also are ready to do work, from babysitting, house cleaning, yard work, gutter cleaning and leaf raking, to raise funding for their trip. Anyone interested in renting a college student to do these kinds of projects can contact Jim Taylor by email at JimTaylor@letu.edu or call (903) 233-3379.